The Wattle Hotel is the heart of Coomera and a real destination for great food in the region. Relaxed, comfortable and safe, The Wattle is the authentic food, drinks and recreation venue for the local community. Our venue features impressive casual dining, a large kids play area, contemporary public bar, sports bar, premium gaming lounge, function rooms, drive thru bottle shop and extensive parking for our customers. At The Wattle Hotel, we go the extra mile to make sure our guests always experience the best in quality and freshness. We treat our ingredients with respect, cook them to perfection and serve them with a smile while you enjoy our al fresco and cafe-style settings. Relax and enjoy a delicious meal with your family and friends! Free entry with great prizes every week! Weekly Auction's & Lucky Door prizes! 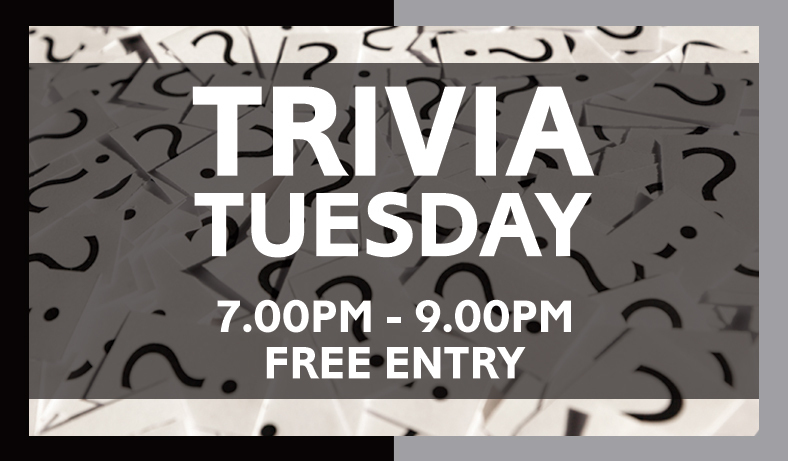 Hosted by Top Hat Trivia's, Lee Rieck! We've prepped up some old favourites to deliver the just for comfort menu on Tuesdays. We hope you'll enjoy a good solid home cooked meal in the comfort of the pub. Choose from bangers and mash, parmy burger, garlic and herb chicken breast, spaghetti bolognese or a Guinness and beef pot pie. Our Schnitzel night is back by popular demand with a new fresh range of toppings to choose from. Thursday is now home to Curry in a Hurry, with four delicious curries to choose from, which will become your favourite? Chicken Thai Yellow, Rogan Josh, Japanese Beef or Egg and Vegetable? 4 Members will be drawn from a virtual barrel, one prize per person. Each Winner will receive a meat tray. Drawn during the end of work, knock-off time 4pm - 5pm, every Friday and ongoing. Members must be using their cards in the machines in order to earn tickets into the virtual barrel. A minimum turnover of $20 will earn a single ticket into the draw. 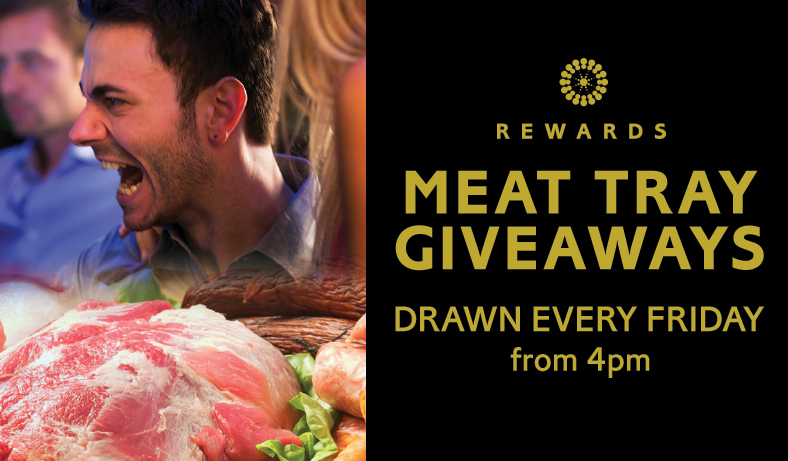 Each winning member will receive a meat tray to take home. 4 Members will be drawn from a virtual barrel. They will be competing against a staff member, both winner and staff will roll a giant plush toy dice, whom ever rolls higher will win. If the member fails, they still receive $5 cash as a consolation prize. 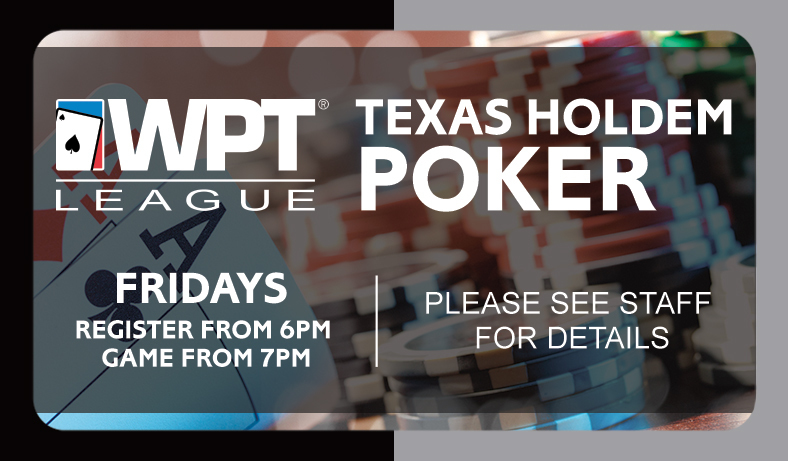 Bring your Friday night Poker face down to the Wattle Hotel and WPT League and join in on the fun!! Registration starts from 6pm for a 7pm start till late. Members will be drawn from a virtual barrel, winners will Spin the "Wattle Jackpot Wheel" and receive the prize in which they land on. 100 prizes on the wheel with 6 prizes to be won. 6 members will be drawn from the virtual barrel allowing only one prize per person. One of the prizes will be a Jackpot starting at $100, and will increase by $100 each week until it is won. The Wheel will be numbered 1-100 with a prize to suit each number. The Jackpot will start at $100 and increase by $100 a week until it is won. Members must use their cards in the machines in order to earn tickets into the virtual barrel. A minimum turnover of $20 will earn them a single ticket into the draw. Tickets will start to accrue from 11am and will be drawn between 1pm - 2pm every Saturday. The Wattle Hotel treats kids as VIPs. The Wattle Hotel has a purpose-built indoor designer playground area with separate sections for toddlers and older children. The Wattle Hotel is great fun for kids and this makes it easy for Mum and Dad to relax. At The Wattle Hotel, we’re proud to be part of the Coomera community. Our goal is to bring family, friends and newcomers together. We’re all about a better lifestyle and experience for everyone. We support local heroes and we champion people whose achievements make our little part of the world even greater. Please contact us with any community development ideas, or sponsorship of sporting clubs or social groups. The Wattle Hotel offers a premium gaming lounge facility for the ultimate player experience. It’s a safe and comfortable environment to relax and enjoy your gaming. Our staff are well informed and on-hand at all times to offer friendly and responsible service. Looking for a great venue to hold your next function? The Wattle Hotel caters for functions from 10-100 people in a number of different settings. Our function spaces are suitable for all occasions, including awards and presentation nights, birthdays, engagement parties, weddings, Christmas parties and many more. We are here to assist you and help cater to your budgets and needs. Contact us today on (07) 5500 0700 or drop in to speak with our friendly staff. Liquor Stax Bottle Shop is The Wattle Hotel’s take-away outlet. We offer friendly service and fantastic value with all your beverage needs. When you work for The Wattle Hotel, you’re part of the family. We’re a team of professionals, dedicated to excellence in all aspects of the game, and the game is hospitality. From management to bar staff, from gaming service to kitchen staff, we’ll all here for one reason, and the reason is to serve our customers exceptionally well. We have extensive staff training policies and career development programmes in place so we create industry-leading levels in service. If you think you’re ready to be part of The Wattle Hotel team, contact us with your details and resume below.